CINCINNATI, Ohio – The United Way of Greater Cincinnati and Partners for a Competitive Workforce are hosting a Career Expo & Hiring Event on May 9 to spread the word that many good-paying jobs are available locally in supply chain, construction, manufacturing and health care industries. The expo is being held during Ohio’s In-Demand Jobs Week, which is May 6-10 this year. 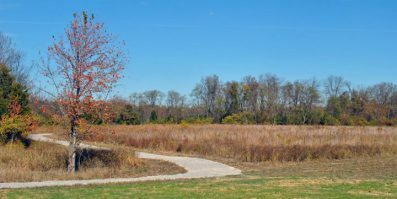 “These sectors are seeing significant growth in the Ohio, Kentucky, Indiana region, with a promising outlook,” said Greg Hudson, adjunct supply chain management at Gateway Community & Technical College. The Career Expo & Hiring Event will be held from 11 a.m. to 4 p.m. on May 9 at Southern Hills Post-Secondary Campus, 2225 Hales Way, Mt. 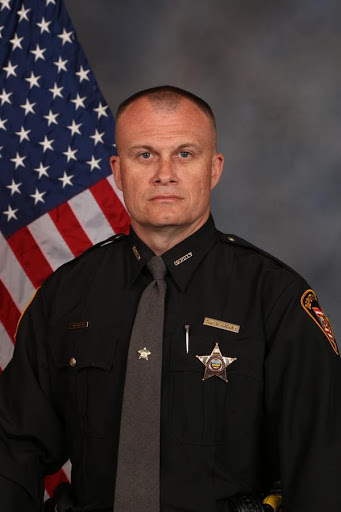 Orab, Ohio 45154. More than 20 companies representing these growth industries will be participating. The event will have two sessions. The first session, from 11 a.m. to 1:30 p.m., will be restricted to Batavia/Goshen/Williamsburg students. The second session, from 2-4 p.m., will be open to all adults seeking employment in any of the listed sectors. More than 200 jobs in Ohio are considered “in demand,” based on labor market information, job postings on OhioMeansJobs.com, JobsOhio regional forecasts and employer forecasts. In-Demand Jobs Week is an opportunity for students and job seekers to learn more about the rewarding and high-demand careers available locally. BATAVIA, Ohio (March 15, 2019) — OhioMeansJobs/Clermont County is hosting a free business seminar, “Happy Employees. Happy Business. Why Does Employee Engagement Matter?” from 8:30-9:30 a.m. Tuesday, April 23, at the Clermont Chamber of Commerce, 4355 Ferguson Drive, Suite #150, Cincinnati, OH 45245. Three million Americans quit their jobs every month. Turnover of a single employee can hurt overall performance. Employee turnover costs U.S. companies approximately $160 billion per year, according to experts. Learn how the performance outcomes of employee engagement can be measured using simple and affordable methods for improved engagement in your organization. And then network with other HR staff and business owners. Presenter Jackie Messersmith has more than 20 years of experience as the founder/president of Workflow Dynamics. She is the co-founder and president of Talent Management. Messersmith’s work has been featured in books and articles. For more information or to register for this free event, call OhioMeansJobs/Clermont County at 513.943.3737 or email sherri.bowling@jfs.ohio.gov. Federal employees affected by the federal government shutdown can file for Ohio Unemployment Insurance (UI) benefits if they are partially or totally unemployed due to the federal shutdown. Federal employees that are still working during the shutdown generally are not eligible for Ohio UI because they are considered still employed. Federal employees who wish to file for unemployment insurance are encouraged to file with the state where the individual’s federal wages are assigned. For example, if a federal employee has their residence in California, but their current job is in Ohio, they typically will file with the State of Ohio. By contrast, a federal employee with their residence in Ohio, but a current job in California typically will file with the State of California. New Ohio UI claims may be filed online atunemployment.ohio.gov (*go to the “Unemployed Workers” section under the tab, “File/Appeal Benefits”), or those needing special assistance may call (877) 644-6562. Individuals filing new claims must have at least 20 weeks of employment and an average weekly wage of $261 during the 12 months beginning October 1, 2017, and ending September 30, 2018, to qualify for benefits. A benefits estimator can be found at unemployment.ohio.gov in the “Additional Information section” under the “Benefits Estimator” tab. Federal employees affected by the federal shutdown are required to make an active search for work by applying for at least two positions each week, and providing that information when they file their weekly claims. Unlike other employers, federal employers do not report wage information to state labor departments. Therefore, when the affected federal employee files for Ohio UI benefits, the Ohio Department of Job and Family Services (ODJFS) will send a request for wage and separation information directly to the federal employer. Some federal agencies may not be available to respond to requests for required information, as they too may be affected by the shutdown. Although request forms are always sent to the federal employer and a claimant affidavit of wages to the federal employee, if ODJFS is unable to contact a federal employer, we will use the employee affidavit to obtain the needed information. In these cases, employees will need to ensure their affidavits are accompanied by supporting documents that show wage history. Claims are usually processed within four (4) weeks, at which time allowed claims will be paid for eligible weeks that have been claimed. Federal employees should continue to file their weekly claims while their application is pending. If individuals are paid Ohio UI benefits and later receive backpay for the same weeks, the UI weeks will be considered overpaid, and ODJFS will send a notice requiring repayment of the benefits. 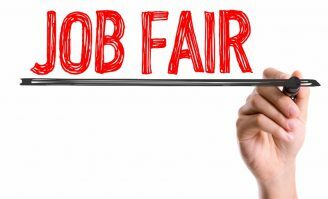 BATAVIA, Ohio (NOv. 6, 2018) — OhioMeansJobs/Clermont County and Child Focus will host a Job Fair from 3-6 p.m. on Thursday, Dec. 6, at Child Focus, 555 Cincinnati-Batavia Pike, Training Room C, Cincinnati, OH 45244. Representatives from local companies will be on-site to meet with job applicants, youth, their families and the public regarding job openings, which are primarily in manufacturing, warehouse, office, health care and retail. Part-time and full-time positions are available. Benefits may include flexible schedules, weekly pay, health care, retirement plans, bonus pay, tuition reimbursement and more. Employers include Design Within Reach, Firestone, RDI Corp., Home Instead Senior Care, Express Employment Professionals, ChildCare Careers, OMNI Medical Transport, and Frontline National. For more information, call OhioMeansJobs/Clermont County at 513.943.3737 or go to omj-clermont.org for more details. Remember to dress appropriately and bring your resumes — you may be shaking hands with your next employer! BATAVIA, Ohio (Sept. 10, 2018) — OhioMeansJobs/Clermont County is hosting a free business tax law seminar from 11:30 a.m.-12:30 p.m. on Thursday, Oct. 4, at the Clermont Chamber of Commerce office, 4355 Ferguson Drive, Suite 150, Cincinnati, OH 45245. What does a small business owner need to know? Are the new tax laws important to you and your business? Why is it important to have a business protection plan? Get answers to these and other questions at this free lunch and learn from Western & Southern. Program hosts include Tara Manis and Gina Schenk, registered representatives with Western & Southern Life. Their goal is to help small business owners plan for the financial future of their businesses, themselves and their employees. Kate Goldsmith, JD, CLU, advance markets consultant for Western & Southern Financial Group, will also offer insights. Reserve your seat today for this event! Call or email Business Services Representative Sherri Bowling, OhioMeansJobs/Clermont, at 513.943.3737 or sherri.bowling@jfs.ohio.gov. BATAVIA, Ohio – OhioMeansJobs/Clermont County will open at a new location at the Clermont County Family Support Center, 2400 Clermont Center Drive, Batavia, on Monday, July 2. Its last day at its current location at 756 Cincinnati-Batavia Pike, behind Eastgate Mall, is Monday, June 25. OhioMeansJobs/Clermont, which provides services to both job seekers and employers, will reinvest the money it will save in overhead costs, such as leasing the current location, toward services for its customers, said Ted Groman, Assistant Director, Clermont County Job & Family Services. It has been at the Batavia Pike location for 15 years. During the move, staff members can still be reached through the general phone number, 513.943.3000. OhioMeanJobs/Clermont’s partners will also be moving. These include Greater Cincinnati Behavioral Health, Easter Seals Tristate, Vantage, Clermont County Probation, and Ohio Department of Job & Family Services. Off-site partnerships include the University of Cincinnati-Clermont, Grant Vocational, Great Oaks, Adult Basic Literacy Education, the Literacy Council of Clermont and Brown County, and the Clermont County Chamber of Commerce. “We look forward to serving customers in our new location,” Groman said. OMJ’s hours will be 8 a.m.-4:30 p.m. Monday-Friday. Its office is on the 2nd floor. 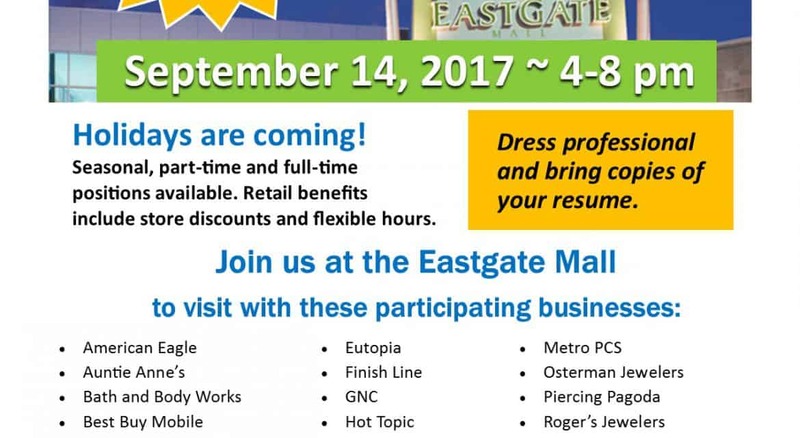 BATAVIA, Ohio — Job seekers interested in retail opportunities will be able to interview with more than 20 employers at Eastgate Mall from 4-8 p.m. on Sept. 14 as OhioMeansJobs/Clermont County and Eastgate Mall host an Eastgate Retail Job Fair. The mall is located at 4601 Eastgate Blvd., Cincinnati 45245. The positions offer flexible schedules, store discounts, and a convenient location. “It’s a great opportunity for those looking to earn extra money through part-time, full-time and seasonal positions as the holiday season approaches,” said Greg Cottrill, business representative at OhioMeansJobs. Applicants are asked to dress professionally and bring copies of their resume and identification. There will be on-the-spot interviews. BATAVIA, Ohio (March 2, 2017) – Employers are invited to attend an inaugural Reverse Job Fair, hosted by OhioMeansJobs/Clermont County and Clermont County Developmental Disabilities (DD). It will be held 10 a.m.-2 p.m. March 21 at OhioMeansJobs, 756 Old SR 74, Suite A, Cincinnati 45245. Clermont County DD has selected 15 individuals who can fill a variety of positions that are commonly posted online. With the help of OMJ/ClermontCounty and DD, individuals will create resumes and practice interviewing. Industries being represented include food service, hospitality, retail, customer service, manufacturing and others. There is no cost to this event. To register or to have your questions answered, please contact Sherri Bowling at: Sherri.Bowling@jfs.ohio.gov or 513.943.3734.